While I am an admitted auteurist in my approach to writing about film, I also recognize that the director is not always the dominant personality in the making of the film. Prior to seeing A Minute to Pray . . . , I was able to see two earlier westerns by Franco Giraldi out of the four directorial credits. His first, Sugar Colt is lightly serious, with several comic moments. Seven Guns for the MacGregors, about a Scottish clan out west is quite playful, as is presumably its sequel. The tone of A Minute to Pray is more serious than those earlier films. In this case, the film's author, literarily and thematically, is producer and co-writer Albert Band. The story centers on an outlaw, Clay McCord, known for his way with a pistol. McCord is also suffering from uncontrollable pain and spasms in his right arm. His biggest fear is of dying in the streets from epilepsy like his father. We have shots of extreme close-ups of McCord's eyes dissolving into shots of McCord as a boy, helpless as his father is lying in a muddy street of some frontier town. In frustration, the teenage McCord picks up a nearby gun and shoots the townspeople laughing at him and his father. As an adult, the right arm becomes virtually paralyzed in moments of stress. 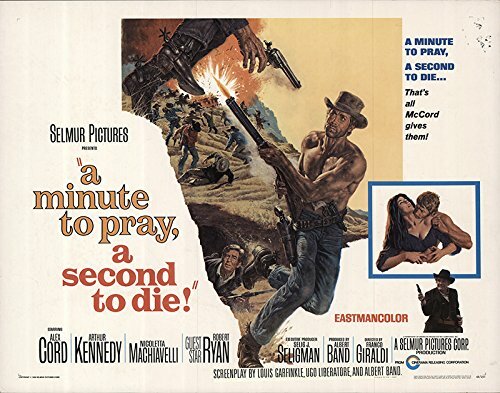 With his physical limitations, McCord contemplates accepting amnesty in a small New Mexico town, offered by the marshal on orders from the governor. Getting in the way are bounty hunters hoping to cash in on the reward for McCord, and McCord's decision to temporarily hide out in an isolated town taken over by a bandit gang. Albert Band wrote the screenplay with his usual writing partner, Louis Garfinkle, and their Italian writing collaborator, Ugo Liberatore. Without giving to much away, there is some similarity to be found with Band and Garfinkle's first wok together, the psychological horror film, I Bury the Living. In the earlier film, the head of a large cemetery believes he has caused the death of several people due to his placing black pins on the map of burial spaces, teetering on madness as the film progresses. What seems uncanny is given a more mundane explanation. In A Minute to Pray . . ., the reveal near the end provides a simple explanation freeing McCord of his psychological torture. Sergio Corbucci was originally scheduled to direct. There is none of the stylish cinematography found in the Corbucci-Band The Hellbenders, especially with that film's cemetery scene. There is one shot of McCord seen in the distance with a trio of outlaws sitting by a fire in the foreground. The camera pulls back to reveal that there are several more men than the initially seen three. Otherwise, as film historian Alex Cox notes in his commentary, visually A Minute to Pray . . . could almost pass for a Hollywood western. It is also worth noting that while the financing came from Hollywood, hoping to cash in on the recent popularity of Italian westerns in the the United States, Albert Band should be credited for development of the genre. After a handful of low budget independent films in Hollywood, Band and Garfinkle set up shop in Italy. Their first western, like most of these films, an Italian-Spanish co-production, was Gunfight at Red Sands (1963). The star was American expatriate Richard Harrison, remembered as the guy who suggested that Sergio Leone offer a starring part to a TV actor when everyone else had turned him down. The music was the first western with music by Ennio Morricone. With Hollywood money and a bigger budget than often found on these films, Band was able to now cast bigger names. The late Sixties was the time when the usually morose Alex Cord was accorded big screen stardom. His Long Island accent almost makes me wish he was dubbed along with the Spanish and Italian actors. Faring better in supporting roles are veterans Arthur Kennedy as the marshal, and Robert Ryan as the two-fisted governor. Ryan appears to be having fun with his role, a glint in his eye and the hint of a smile as he takes on all challengers. One of the highlights is seeing these two in action during the big gunfight near the end. The film score was by Carlo Rustichelli, with music that veers from hints of foreboding similar to his music for Mario Bava's horror films, to romantic Spanish guitar themes, to the full orchestra swelling to melodies that might remind one of Mahler or Wagner. Hollywood influence definitely had a hand in how the film was presented in the United States. 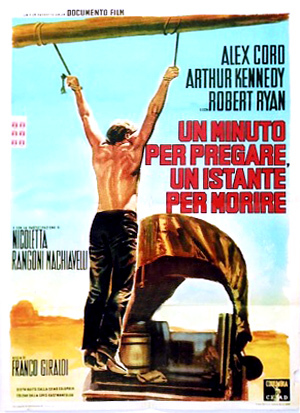 The original Italian release of A Minute to Pray . . . is reported at 118 minutes. What is available here is the U.S. release version, short by about twenty minutes. Most of what has been cut was a subplot regarding the outlaw town where McCord is in hiding. What Kino Lorber has made available is the original ending of the film, which looks like it was recorded off of a Japanese television broadcast. That original ending is nihilistic, but also a more fitting conclusion.